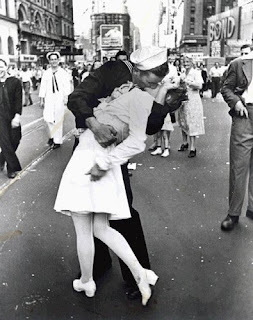 Edith Shain, the nurse in Eisenstadt's famous V-J Day photo, has passed away. Hear Eisenstadt's commentary on the photo here. Here's Shain interviewed for NPR's All Things Considered in 2005, discussing the end of the war and the moment captured in the photograph. Shain's passing is the sort that makes one wish Robert McG Thomas was still alive and writing obituaries. The one in The Washington Post is about as solid as any I've found.